is located on the north eastern edge of the Delta Orinoco nature reserve which was established in 1991 in order to conserve the plants, animals and birds of this area. The Orinoco River Delta is inhabited by the Warao Indians and the camp is designed and construction according to their customs. 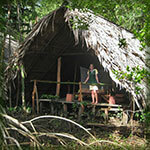 The sleeping huts are located in clearings in the jungle and have thatched roofs but no walls. Visitors sleep in intimate contact with the forest in beds or hammocks protected by mosquito nets. Jungle walk: A native Warao guide will lead you on a walk through the dense jungle of the Orinoco Delta; and for those who have never penetrated virgin jungle before the experience is unforgettable. The tranquil silence is punctuated by the songs and calls of birds and the scary screeching of howler monkeys as you wander through a myriad of exotic plant life. Wellington boots are provided for all guests. 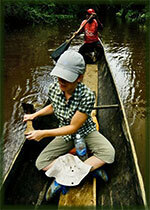 Canoe excursion: Warao means "canoe people" and there is no better way to explore the delta than a canoe. A native guide will take you up narrow backwaters tunnelling through the dense vegetation where other boats can’t go. Venturing deep into the jungle will give you unique glimpses of the delta fauna; including multihued exotic birds like the Toucan and Macaw, fresh water dolphins, multihued butterflies and howler and capuchin monkeys. Buffalo Farm visit: An evening visit to a local farm where the dense rainforest meets the open swamp introduces you to the contrasting landscapes of the delta and opens up a view of a spectacular sunset. 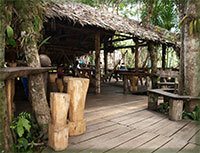 The Buffalo farm is populated by many interesting animals and horse riding can be arranged. Night Safari;A favourite adventure for guests is a night-time canoe trip to spot crocodiles and water snakes, before or after dinner depending on the river water level. Your accommodation in the camp is in private cabins, Warao style, each with a wonderful view of the river, often garlanded with floating beds of bora, purple hyacinth. Sleeping is in single or double beds or in hammocks if you prefer. There are toilets, showers, and wash basins in the "common house", as well as outlets to recharge batteries for your electronic and camera equipment. The groups and the boats that carry them are kept as small as possible to minimize our carbon footprint and to let you see more wildlife and enjoy more intimate contact with the local Indians. We make a point of caring for all the fauna and flora. Many of the animals and birds in the camp have been raised from infancy and treat the camp as their home. The Warao Indians still live in their traditional rain forest culture that has existed for thousands of years. For visitors coming from a modern consumer society meeting them is an extraordinary experience which can stimulate and enhance your appreciation of life.